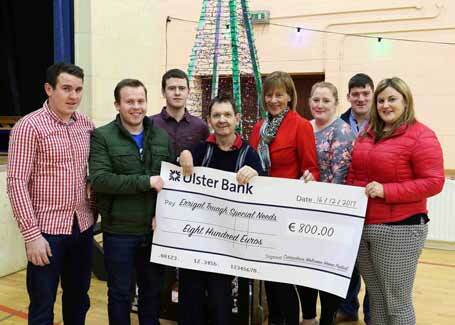 A Cheque for €800 is handed over to Thomas Hanna, representing Errigal Truagh Special Needs. The funds are proceeds of a Tractor Run organised as part of the Carrickroe Festival 2017. In picture are from left: Kevin Connolly, Run Organiser; Brian Connolly, Run Organiser; Gary Connolly, Run Organiser; Thomas Hanna; Helen Cuddy; Edel Tierney, Festival Committee; Michael Murphy, Run Organiser and Terese Fealy, Festival Committee. 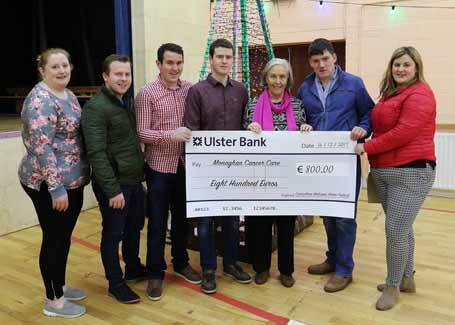 Maeve Hackett, representing the Monaghan Cancer Treatment Support Group, accepts a Cheque of €800, proceeds of a Tractor Run, organised as part of the Carrickroe Festival 2017. In picture are: Edel Tierney, Festival Committee; Brian Connolly, Run organiser; Kevin Connolly, Run Organiser; Gary Connolly, Run Organiser; Maeve Hackett, MCTS; Michael Murphy, Run Organiser; and Terese Fealy, Festival Committee.